A 1/18-scale, off-roading, bundle of fun. One way in which I gauge my interest in a radio-controlled car or truck is how often I take it for a drive. While there’s not enough time in the day to run every machine, I have to go with my gut and grab the vehicle that best-fits my schedule and location. Soon after picking up one of Axial’s two newest 1/18-scale entries, the Yeti Jr. Rock Racer, I felt the urge to pick up and drive this machine more so than others. Between the size, the speed, and the overall fun factor that this off-road buggy carries with it, there are many great aspects of Axial’s first step into the world of small-scale R/C. No matter the scale, you’d expect a radio-controlled vehicle that’s geared for off-road use to feature Durable components and include room to customize and fine-tune its performance. The Axial Yeti Jr. Rock Racer doesn’t disappoint in this area. The chassis tub is molded from impact-resistant material and the connected suspension components are equally as strong and battle tested. My first experiences with this vehicle were held indoors, so my top speed didn’t reach its full potential. That said, There were a fair amount of tumbles, flips, and rollovers to test the strength of the Yeti Jr’s chassis. Oil-filled shocks provide ample cushion when traveling over bumps and rough terrain. While the weight of the Yeti Jr. Rock Racer isn’t what I’d call “heavy”, it’s enough to compress the suspension when landing a jump. To that end, the suspension travel is adequate enough to prevent the machine from excessively bottoming out after catching air. As a scaled-down version of the 1/10 Yeti, this little rock buggy can take a fair amount of abuse without much cause for concern. The shell of the Yeti Jr. Mimics the appearance of its larger-scale cousin. That’s one of the reasons I’ve grown to enjoy this little machine as much as I do. 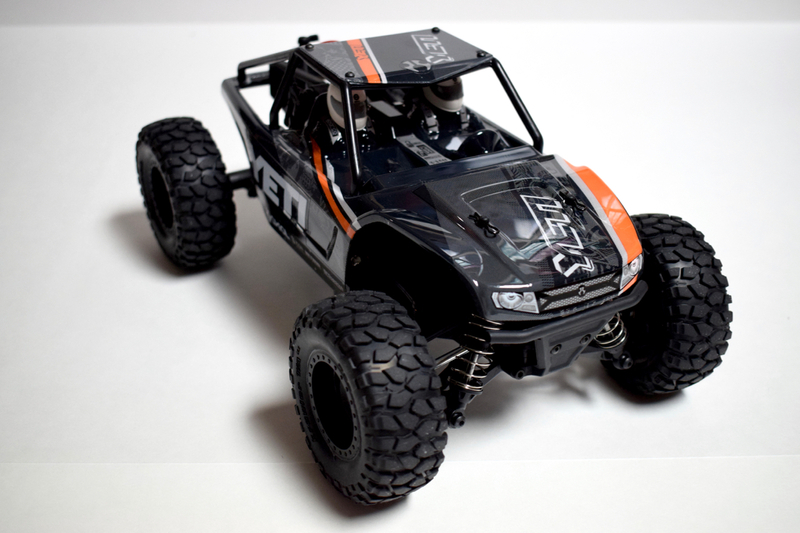 Visually-aggressive and eye-catching (thanks to the orange, gray, and black graphics), this radio-controlled vehicle is easy to spot, no matter where you’re driving it. On the durability side, the polycarbonate “lid” is quite resistant to damage from basic rolls, and impacts. That said, I’m sure you could find a way to crack it and bust it up if you try hard enough. 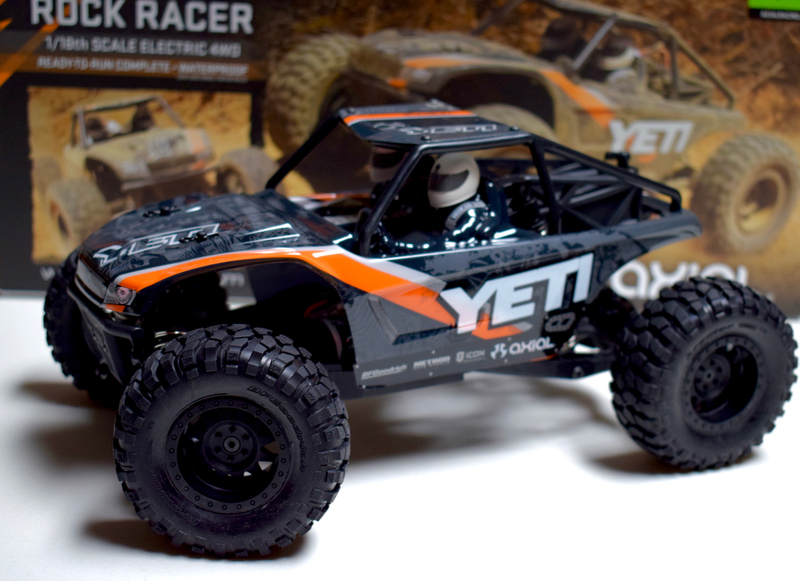 Axial’s Yeti Jr. Rock Racer motors along dutifully thanks to a 40-turn brushed motor. While that high turn number might trick you into thinking this buggy has more torque than top-end, you’d be mistaken. Thankfully, the gearing is such that there’s a fair amount of takeoff and full-throttle speed with the stock setup. My familiarity with Tactic radio transmitters only extends as far as the models that were bundled with my Axial RR10 Rock Racer and the Yeti Jr. Focusing on the TTX200, it is a solid controller with a basic set of features. No frills, no unnecessary buttons or knobs, just what you need, when you need it. Comfort-wise, it’s taken me longer to get used to the feel of the TTX200 as opposed to other transmitters that I’ve used. Whether the grip size is larger than what I’d expect or the placement of the throttle trigger isn’t what I’m used to, there’s something About this controller that I’m not entirely at-ease with. Aside from the feel, the trim buttons, while easy to find, can take some getting used to when making adjustments. This is one area of the Yeti Jr. that’s caused me to refer to the instruction manual more than once. Not to give too much away in that heading, but I’ve become quite a fan of the Yeti Jr. Whether I wanted to drive a vehicle around to kill some time or if I needed a distraction and a chance to “reset”, this vehicle didn’t and hasn’t disappointed me in the level of fun that it brings to the table. Indoors or out, there’s plenty of speed from the stock motor and Gearing provide ample pep and top-end speed is decent. While it could always be faster, the Yeti Jr. Is a quick performer that seems happiest when bouncing over bumpy terrain and floating over jumps. Out of the box, the handling performance Of this machine is quite good. I have made some small compression-level adjustments to the shocks, but other than that, this rock racer has retained its stock setup. When I first picked this vehicle up, there was a mix of snow and slush on the ground. No vehicle, save for the RR10, has delighted me more in snowy conditions as this one has. Its light weight allows it float across snow and it can thrash around in slush without much trouble. As we’ve transitioned from winter into spring, the Yeti Jr. has proven to be a great machine on grass and pavement as well. Tall grass will slow it down, but it is still able to get traction and keep on moving. Short grass, coupled with a few log jumps and obstacles make for a great opportunity for some airborne fun. Repeated launches and landings didn’t affect this machine at all and the shocks took in the impact as-intended. There is one small item that I view as a downside to this model. 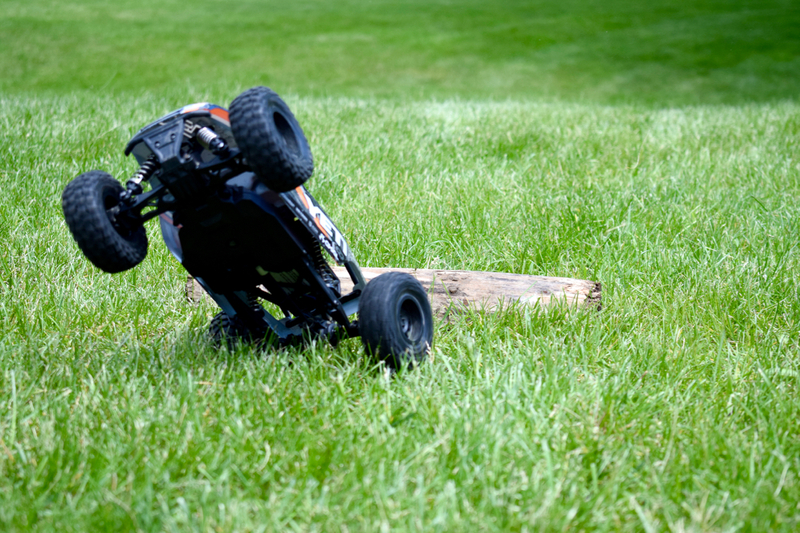 The stock steering servo ( Tactic TSX106) lacks turning turning power, especially in thick grass or snow. I encountered a few instances where the wheels wouldn’t return to neutral when the steering wheel was centered. The added manual control became a point of frustration after a few drives and I decided to swap out the servo for a higher-torque model. 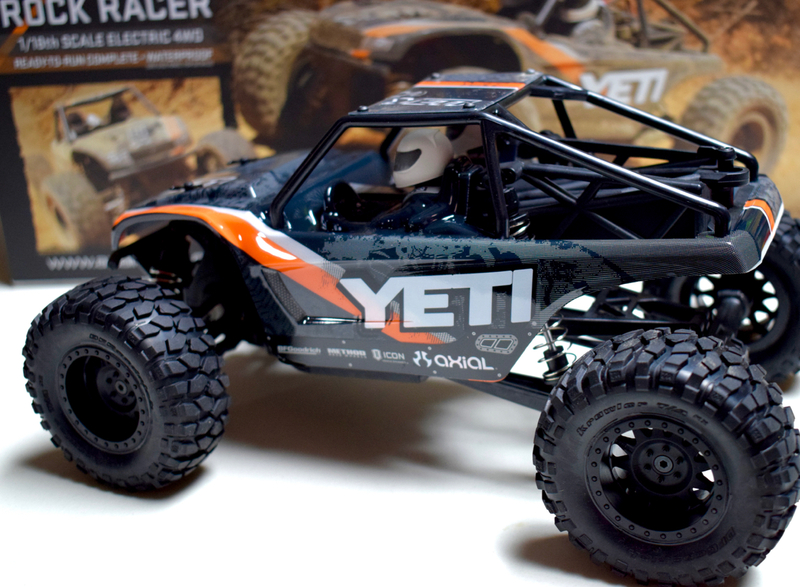 Is the Axial Yeti Jr. Rock Racer Right for You? 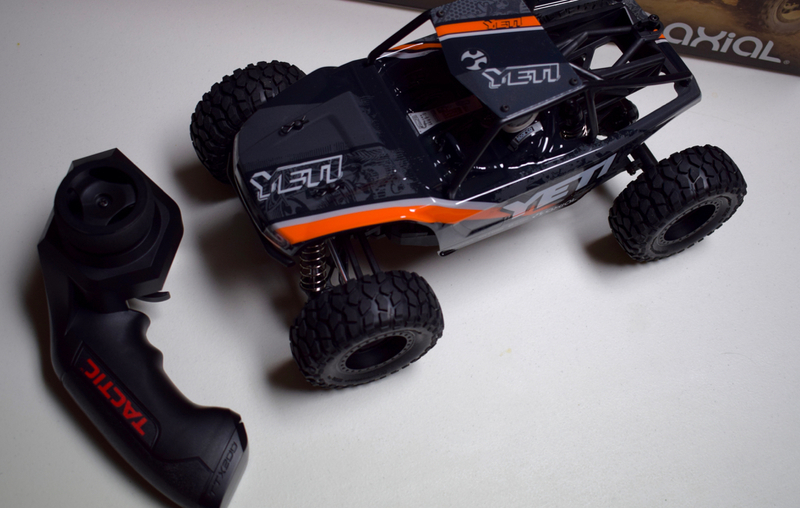 As small-scale, off-road R/C vehicles go, the Yeti Jr. Rock Racer is a powerful option, combining both fun and versatility. The compact, 1/18-scale size makes it a excellent “grab and go” vehicle, which is something that I take into consideration when reviewing the qualities of any radio-controlled machine. While the steering servo isn’t as powerful as I might have liked, that’s not to be seen as a deal breaker, in my eyes. There are a number of servo upgrade options available and, for a minimal investment, you can keep the stock servo on-hand, should you need a spare. 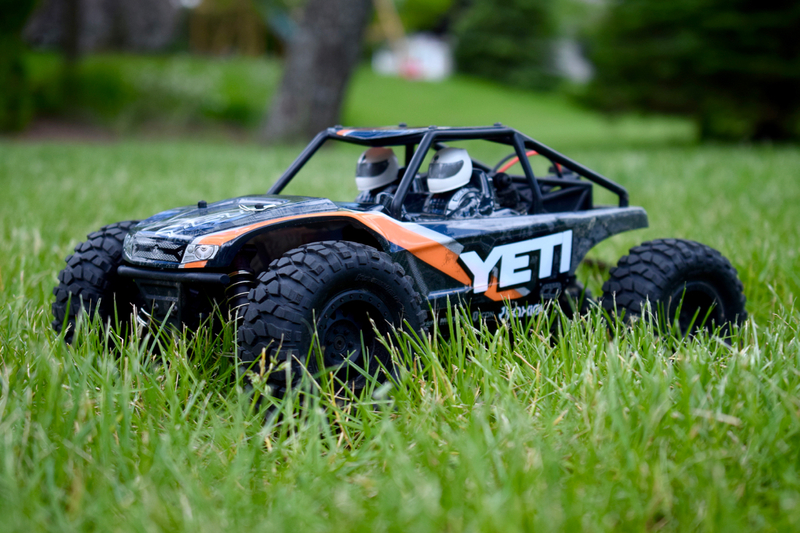 Seeing as how this is one of my go-to vehicles for driving, jumping, and just messing around with, I’d say the Yeti Jr. is great for adding to (or starting up) your R/C collection. When this model was introduced in December 2016, it was priced at $179.99. Since that time, the price has been reduced to $159.99. At that price, this machine, and it’s SCORE Trophy Truck cousin is well worth the cost.